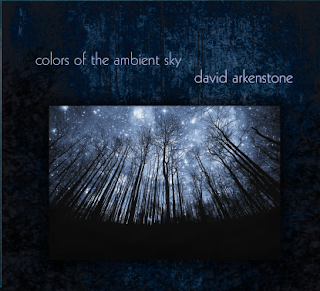 David Arkenstone is about to make the summer brighter with a new release in July titled Colors of the Ambient Sky. He is the author of an astounding 65 recordings! David is primarily a keyboardist, plays the guitar, mandolin, flute, cello, percussion, and many other instruments. He utilizes all the tools of the music trade, including the computer to provide orchestrations that provide beauty and texture. On this album it is all David, there are no guest musicians. You soon realize what an amazing accomplishment this album is once you hear it for the first time. If you look closely at the CD cover it is like lying on the ground looking up at the treetops and star-filled skies. The music fits well with the album cover. It takes you to a higher place of consciousness like the one beyond the treetops. What you hear is music that could easily be used for soundtrack or other media deliveries, but more importantly it gives you an outlet for relaxation. As the artist suggests, it is like dreaming with your eyes open. I have been hearing much more of this type of ambient music lately and have thoroughly enjoyed it. As a matter of fact, it has prompted me to seek out other similar artists. Tracks like “Blue Lightning” reminded me of one of my favorite Tangerine Dream albums titled Le Parc. Colors of the Ambient Sky has pleasing spacey and relaxing ambient sounds with the hints of technology swirling around it. For me, there is just enough of all of that Colors of the Ambient Sky to keep me interested and quite satisfied. I would expect Colors of the Ambient Sky to be one of the more popular releases of 2018 in the ambient and new age genres. I really appreciated the overall consistency and textures of the music from track to track. I was envisioning an artist painting with many different colors and taking the time to put them in the right place on the canvas to create another masterpiece. I felt like it was ear candy that was transformed in my mind’s eye into colors and images. For my musical tastes, this is the kind of experience I truly enjoy. I do not go into a listening experience with anticipation, it would ruin the birth of new thoughts and feelings it could possibly create. That is a good policy for any listener actually. As the closing track “Ascension” brings the curtain to a close, you realize just how positive and uplifting a musical journey can bring. Your skies will be colored with a broad musical brush that will touch you in so many ways. That is all any listener could ask for.